Live betting is essential and very important in the betting industry, in the UK almost all operators offer the live betting service, each one has different characteristics, although some punters do not care about the differences, those small details in the service of live betting among the bookies make you earn or lose thousands of pounds a week and you didn’t know! The Ladbrokes system is marvelous technology; you could say they have one of the best live betting services in the national betting industry, it’s just insane. The things that can be done with Ladbrokes live betting are unique and highly profitable. The live betting service has all kinds of statistics available and the odds are updated quickly according to the phase of the match or sports event available. Bets are approved in 10 seconds or less, which is a great relief in live betting. Punters can place bets while watching the match live on the website, tv or app. The Ladbrokes app has several special options for live betting. The app is fast and the interactive pitch shows the latest moves of the match and stats updating on a second. Most sporting events that are offered in the live betting section have live streaming directly from the source. Permanent service, with more than 6 sports simultaneously, especially English football covering the main leagues and major events in the kingdom. The website is sometimes a little slow to load all the data about the sporting event in live betting. Some offers and promotions are available for live betting stakes, one thing that other bookmakers do not offer for punters in the UK. In short the Ladbrokes live betting service goes beyond the conventional, the perfect combination between an app and a website to offer a service that meets all the requirements of punters in the UK. Any punter can use live betting in Paddy Power, it is very easy to learn and anyone can learn how to use in few minutes. The service also offers an excellent graphic design with all sorts of tools for punters. One of the best things about Paddy's live betting service is the huge amount of sports available every day for live betting. Sports events with more than 100 markets and betting options, similar to other bookmakers in the industry, but Paddy Power only collects and offers the most lucrative markets and options in each event. When using the live betting service with Paddy punters enjoy incredible benefits. Live betting is available in the official operator's app, with the same functionalities, offers and promotions as the website. The app is easy to use and very similar to the official bookie website. Available for iOS and android. Virtuals available for the live betting option, almost no other bookie in UK has this service for the virtuals. Football, horse racing and other sports among the live betting list. Live streaming of most live betting events, available especially for UK. Football matches and other events can also be seen in the official operator's app. Live comments and other specialties. Competitive odds in live betting, over other bookmakers Paddy Power has better odds and they much more lucrative. The difference ranges from cents to full points in the markets. Live betting bets are usually approved in a short time, especially if they are fast sports events such as baseball, football, tennis or golf. Paddy Power meets all the expectations of a live betting service, it has multiple options and markets for the day's events, highly lucrative odds, different sports and the possibility of using the live betting service using the official app of this bookmaker on almost any device. To be one of the greatest operators in the UK, Coral stands out offering live betting in almost any event available in the world, similar to other bookies but with the simplicity that the events have more options of markets and the majority have cash out available in the live betting service. Cash out available at most events, no other bookie in UK has cash out at all live betting events, Coral does and shows it at their service. The most important events with live betting have cash out for almost all markets, including national and international venues. Simple but powerful live betting interface, events are shown according to the order of the day and the main option of bet is 1X2 for football, the most lucrative options and markets are shown in the main live betting panel. Live streaming and interactive pitch with the latest statistics, information and any changes available in the sporting event. The sports with interactive pitch are Football, Tennis, Hockey, volleyball, basketball and baseball. More than 100 events available every day in Live Betting, Coral probably have the most daily events available among UK bookies offering live betting. Each event has the same amount of information, options and offers as other bookies. 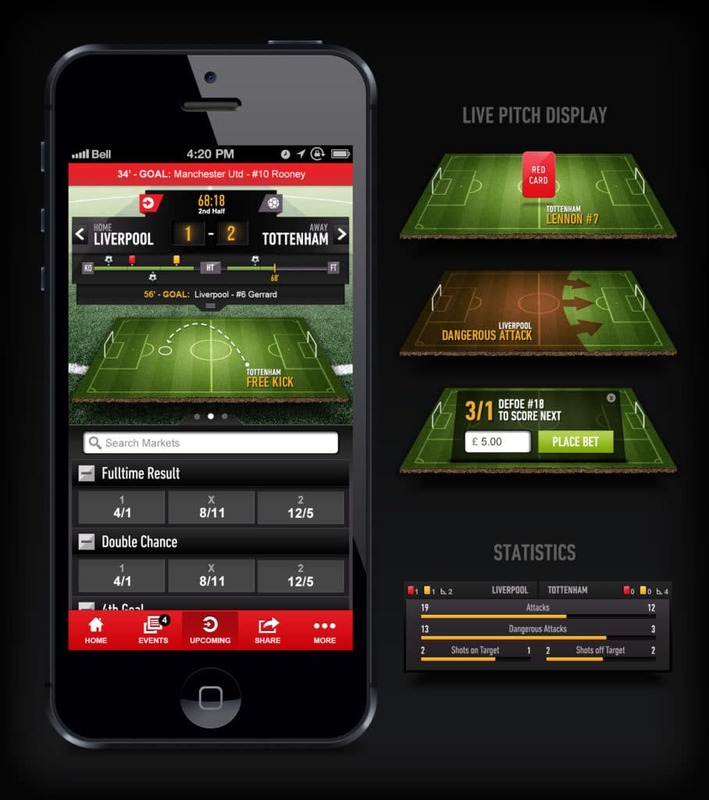 The official Coral app and mobile website offer the full live betting service, as well as other unique features. The app can be downloaded from the official website of this UK operator. Due to the simple interface of live betting in Coral, it can be difficult to find betting options and markets in the events, but with a little time understanding the process any punter will move like a pro. Coral has greatly improved its Live Betting service, at the level of offering almost the same as other bookmakers of the competition but with better options and more sports. Punters who use the app with live betting can enjoy promotions and get free bets at special events. All the time Bet365 has offered live betting, is one of the first bookmakers in UK to have the service available to punters in the country. Thanks to the impeccable trajectory of this bookmaker the live betting system is one of the easiest to use and the one that has the most benefits for punters that are looking for quality. More than 10+ main sports for live betting especially with esports and other special events. Bet365 offers a full schedule of upcoming live betting events for the next 24 hours. Special features include personalized alerts for live betting events. 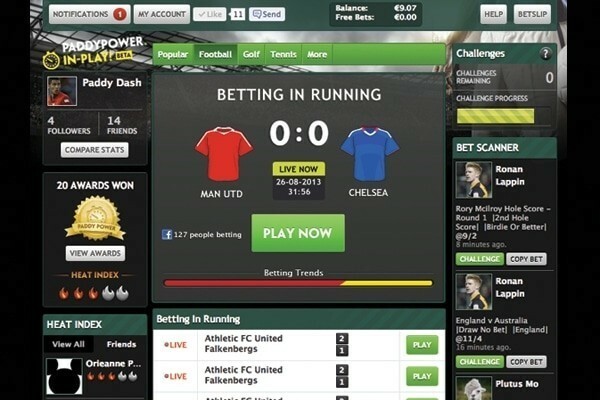 Modern and fast betting system for live betting. Interactive pitch with statistics, timer, and everything related to the event in question. It is advisable to use Wi-Fi on the smartphone or internet with the desktop pc when using the live betting service. 100+ live betting options to place bets, from the most common options to the most exotic options requested by punters such as Asian Handicap, Draw no Bet, halves, among others. Mobile website with live betting with the same capacity as the conventional website, in addition to offering other advantages to punters like specials and options with free bets. The mobile website loads fast and has no graphics; the design is elegant and pleasant. no possibility to make live betting with the ease of an app, only through the mobile website. Not having an app takes away some prestige from this operator. Live betting with this operator has become somewhat affordable for punters, easy to use and with high odds for most of the events available in the day. What categorizes Betfred's live betting service is that they do not waste time competing with other bookmakers, Betfred makes a difference by offering a live betting service that serves as an example for other bookies in the UK and the rest of Europe. Football as the main sport in live betting, multiple market options around 50 per event and other offers available. Premier League and all other leagues in UK, Europe and the rest of the world. Cash out available in live betting, all major events and football matches have cash out without exception. The odds are high and competitive in the markets available within Betfred cash out events. Ease of use of the live betting service, the design of the live betting section is simple, without graphics but with everything necessary to take advantage of sporting events. The approval of bets and updating of the information in live betting is quick and efficient, there is no other bookmaker that combines speed and efficiency as Betfred does in its live betting service. Totally worth it. 40+ markets and options for live betting events, wide selection of high odds betting options for all types of punters. Every single day of the year Betfred live betting event has a high chance of becoming a get rich quickly chance. App with all live betting options and other offers for live events, with the same security of the website. The app is compatible with android and iOS, the download is available the Betfred website. This promo code will give you a special in-play offer. The website has limited information in the live betting section; apparently, it lacks much more development in the long term. It is not recommended for punters who like to have data and information in great quantity. No doubt Betfred is one of the best live betting bookies, not only because of the number of events and options but also because he is a bookmaker with security and trajectory in the UK betting market. 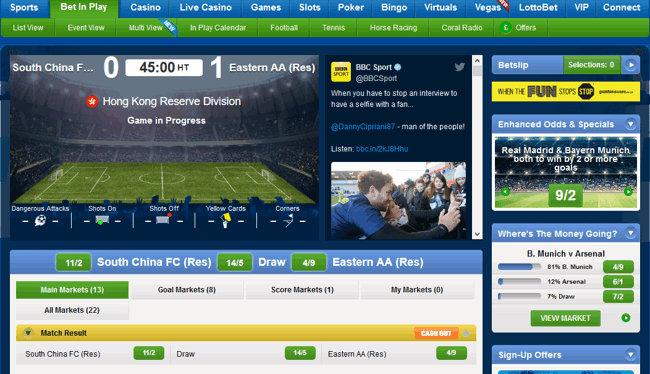 The specialist Exchange also has a live betting service for desktops and smartphones. With the unstoppable growth of this bookmaker, the service has been improving and now has new markets and other options that previously did not offer to the public. 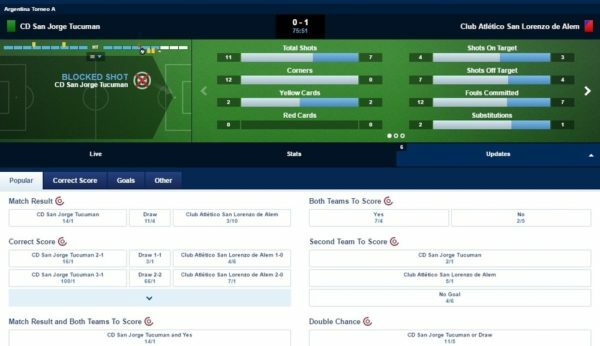 Modern live betting website interface, simple but with a design that attracts a lot of attention and makes bets easier to take. Live betting is available for both the conventional sportsbook and the Exchange section, we are talking about 2 live betting services in a single bookie. This is totally insane, not even the most powerful bookmakers can do it. Betfair for the win. Important events, leagues of the first world with all the major markets, although somewhat limited, Betfair have high odds for them to be used by punters in general. Availability of using the live betting service through the official betfair app, which has a large number of special options and personalization alerts to follow the most important live events. 5 main sports, football, cricket, tennis, basketball and hockey, in addition to other specials that are offered according to Betfair. The limitation in the markets continues inside Betfair, especially for football, they do not even count with 15% of what other bookies offer in their live betting service, apparently they won’t add more markets for now. Betfair as a provider of multiple services has been perfecting its different services, and live betting is one of those services that has been growing at the same pace as other services within the bookie, they just need to add markets and improve the quality of information a little.